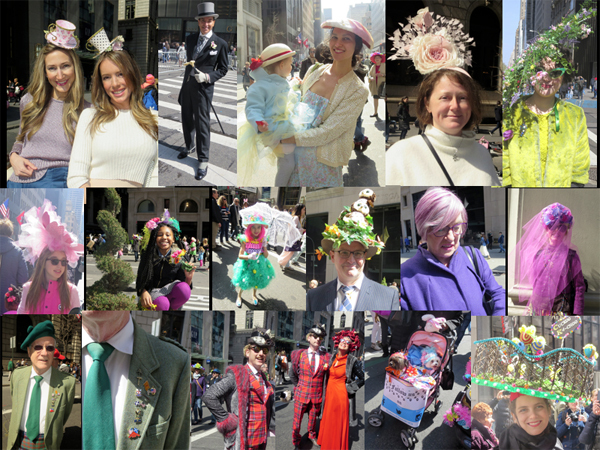 Posts Tagged "Easter Parade Hats"
Home » Posts Tagged "Easter Parade Hats"
Fab funs on Fifth Avenue at the Easter Parade, 2016. Top Left to Right: Teacup fascinators on fashionistas Melissa, left, and Cassandra, a Frédéric Fekkai hairdresser … Looking handsome with top hat, tails, white gloves, walking stick, Gregory Moore on his way to conduct his orchestra for “An Easter Parade Affair” at the Plaza Hotel … Claire James and baby Eva all dressed up with her Easter bonnet and a tulle skirt … Rose fascinator by Arturo Rios on Kate … Garden hat with roses on Nell Johnson. Middle Row, Left to Right: All grown up in gorgeous frothy pink hat … Ava Grace with flowers and braids … Sayuri 7 looking yum in candy colors, pink wig which flowed way down her back and an umbrella … G. A. Neil Smith, a man in a business suit with unexpected fun hat … June Crowther, a woman of a certain age, an amazing 81, in purple glasses and Vivienne Westwood coat, worn with grey hair beautifully shaded in pinks by Simon Nicholls, Fruit Hair Design, Barnsley, UK … Stephanie havng fun with flower hat and a lot of pink tulle.